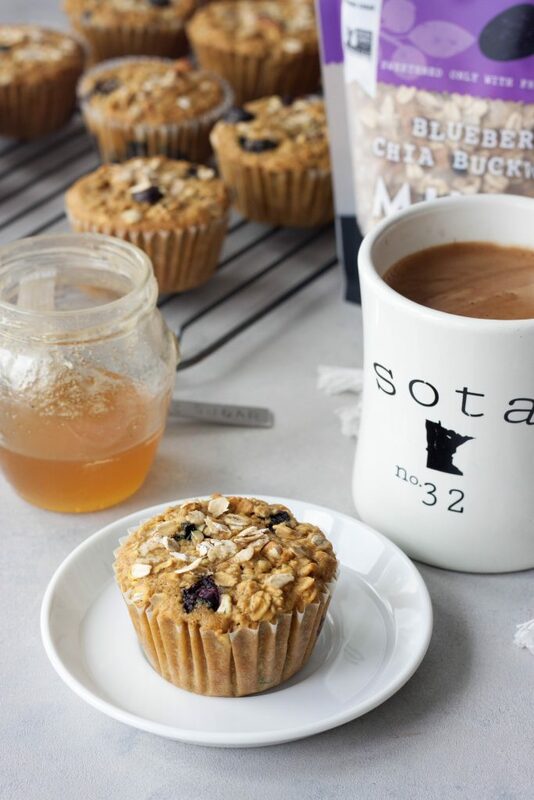 These Lemon Blueberry Muesli Muffins are not sponsored but are made with some of my favorite local Minnesota ingredients. Seven Sundays and Bare Honey will be providing product for an Instagram giveaway mentioned in this post but did not supply product to make this recipe. These are staples in our kitchen that we purchase. It’s a beautiful Monday morning and what better way to start the day then with muffins and a giveaway (over on Instagram)! 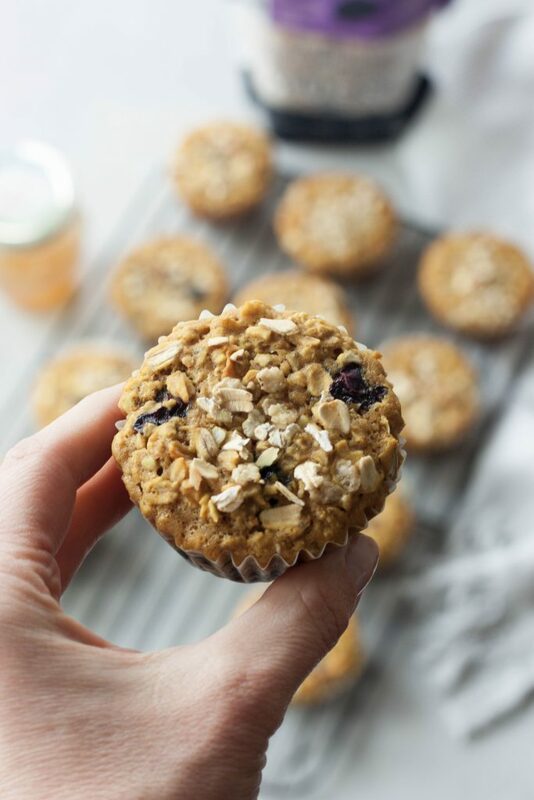 Today I have some delicious Lemon Blueberry Muesli Muffins that are sure to brighten your day. This week I have something special called Minnesota Love Week to share with you. I was sitting one morning enjoying my soaked muesli with berries, my favorite Seven Sundays Cocoa & Coconut Muesli, and I got to thinking about the Farmer’s Market which was still months away and some of my favorite local Minnesota brands. I wanted to share these brands with everyone. Although some of them, like Seven Sundays, are available nationwide it’s still a small (not very small anymore) local company that I love. While they’ve grown and expanded into so many stores the company is still run by owners Hannah & Brady who do all the work and are so down to earth. I reached out to Hannah and told her my idea and if you haven’t heard the term Minnesota nice you are about to and experience it first hand this week! Years ago when we were in Ireland we fell in love with muesli, especially me. If you don’t know what muesli is think of it as natures cereal, it’s a simple mix of whole grains, nuts, seeds, and fruits. Food in Ireland was so simple and while I do like my superfoods I love the simple foods that are local and fresh. I was so excited when I found Seven Sundays and a way to get my muesli back here at home in Minnesota. It’s a staple we always have on hand and enjoy on a regular basis. We take it with us traveling and even camping to fuel our adventures. Typically we just enjoy it soaked, hot or cold. Topping with whatever the mood strikes us at the time fruit, yogurt, honey, peanut butter, ect. I’ve shared countless ways we like to enjoy it on the blog, here are just a few. We do make muesli cakes camping or at home, sometimes cookies, breads, or muffins. As I said Hannah and her husband Brady are two of the kindest people. While Seven Sundays has grown over the years Hannah is humble and one of the most down to Earth people as I said, who enjoys the simple life and the simple things. They are on a mission to redefine America’s go to breakfast cereal. Forget sugary nutrition lacking dry cereal their muesli is minimally processed whole grains, nuts and seeds sweetened only with fruit and organic honey. It’s real food the way nature intended. Hannah and Brady are always giving back. Last fall my daughters and I were able to witness this first hand. Seven Sundays partners with the Sheridan Story which is an organization that fills backpacks for children in need making sure they have food over the weekends when they are not in school. Seven Sundays donates a percentage of their sales to help a sponsored school as well as their time filling backpacks. One Friday last fall when the girls were out of school we went and helped fill backpacks and it was a very humbling experience for both my girls and myself to know that there are children in need so close to home. When I find a product I love with an amazing brand/people behind it, like Seven Sundays, I cannot help but share with everyone. You can even ask my friends and family. The other local brand I’m highlighting in this recipe is Bare Honey. Bare Honey is local honey run by the sweetest family, Grace and her husband Dustin and their two kids. I don’t know how they do it but their honey is so delicious and doesn’t compare to store bought commercial honey. My girls can taste the difference and we think (KNOW) it’s because of their happy bees! When we picture Bare Honey we picture the family farm and their friendly happy bees as their pets as they really do love their bees and what they do. Honey is always something I loved as a kid, peanut butter and honey sandwiches were a favorite. I remember getting honey sticks with my parents and grandparents down at the local farmers market. My girls like those same sticks when we go down there, it’s nature’s candy. My dad use to have someone that had bees and he would get honey from, he didn’t make much and one year we couldn’t get it anymore. As I said store bought just wasn’t the same. Then I didn’t eat it for awhile until again were in Ireland and it was the simple things and local honey ney and food that was all local. The first time I had Bare Honey I was in love, as was the family. We have a cupboard stocked full of different ones my personal favorites being the Bee Pollen Infused Honey (even better for allergies as it’s not only local but you have the bee pollen “power”) and the Cinnamon Spread, all though I love them all for different reasons. I add Lavender Honey to tea and coffee, bake with the Raw Wild Flower, Cinnamon and Vanilla Spread are perfect for our homemade sourdough toast, Bee Pollen Infused for my Bee Sting Turmeric Lattes, and all for smoothie bowls and whatever the mood strikes. A has become so in tuned with honey and can tell you the differences and knows them by taste. Both Seven Sundays and Bare Honey are giving me the opportunity to share their amazing products with one lucky person! I know you are going to love them both as much as my family and I do so make sure you head over to Instagram this week and enter, you aren’t going to want to miss it! Now to the Lemon Blueberry Muesli Muffins! As I said we love both Seven Sundays and Bare Honey in our simple every day eats but also more extravagant. While a delicious muesli bowl with yogurt, berries, and honey would reflect the love and simpleness for these two foods and brands there is nothing like a relaxing morning with the family and brunch. Sipping coffee, the house filled with the smell of these Lemon Blueberry Muesli Muffins baking, and then enjoying a nice warm muffin. While we don’t get too many relaxing weekend mornings and most of our weekend mornings, especially in the coming weeks, will be muesli in jars on the sidelines of soccer we fully enjoy them when we get them. These muffins have so much flavor, texture, and nutrition to fuel your everyday adventures. 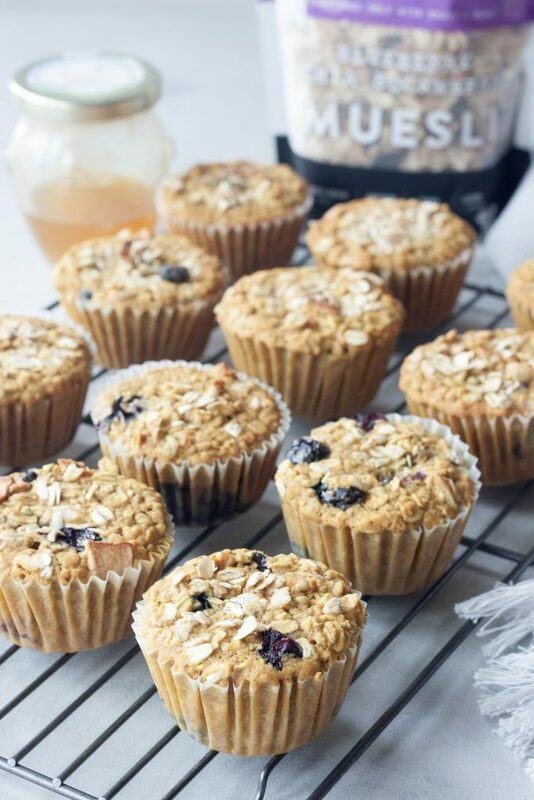 They are a slightly heartier muffin made with muesli and flour, sweetened with honey, packed with fresh blueberries. I also made this batch with Homemade Lemon Turmeric Milk as I make batches of turmeric milk weekly and had just made a batch it. You can use a bottled turmeric milk, or lemon turmeric milk, or you can make these with just coconut milk or other non dairy milk of choice. I just had to test them with the Lemon Turmeric Milk as I’m always trying to add in more turmeric and I loved them and the color it gave them. 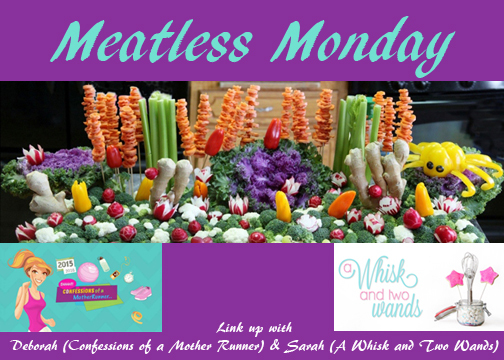 While today is the first day of my Minnesota Love Week it’s also Meatless Monday! Thank you for joining my co host Deborah and me, I can’t wait to see what delicious creations you’ve come up with this week if you have something to share and hope you are all inspired by the recipes below. *Alternatively you can purchase lemon turmeric milk, Rebbl makes a Lemon Tart Golden Milk. You can also make the muffins with just plain coconut or almond milk. Preheat oven to 350F. In a large bowl mix together flour, muesli, baking powder, baking soda, and salt. Zest in lemon, using the whole lemon and only grating in the yellow part and mix into the dry ingredients. You can use the lemon to flavor your water. In another bowl whisk together coconut oil, eggs, honey, and milk. Add the wet ingredients to the dry and mix until combine. Gently stir in blueberries. Let batter sit for 10 minutes. Line or spray 12 muffin cups with coconut oil or non stick spray. Divide batter among muffin cups, I use an ice cream scoop. Sprinkle with muesli if desired. Bake 350 for 25-30 minutes. Let cool for 5-10 minutes before enjoying. *I omit the coconut cream when using homemade coconut or nut milk. Bring milk, turmeric, ginger, and pepper to a boil over medium heat whisking occasionally. Whisk in optional coconut oil and or coconut cream if adding and reduce to simmer for 5 minutes. Remove from heat and grate in lemon zest and whisk in honey. Let sit for 5-10 minutes to cool. Place in an airtight glass jar or bottle the refrigerator to chill. I try to make only what I know I will use in 2 days. 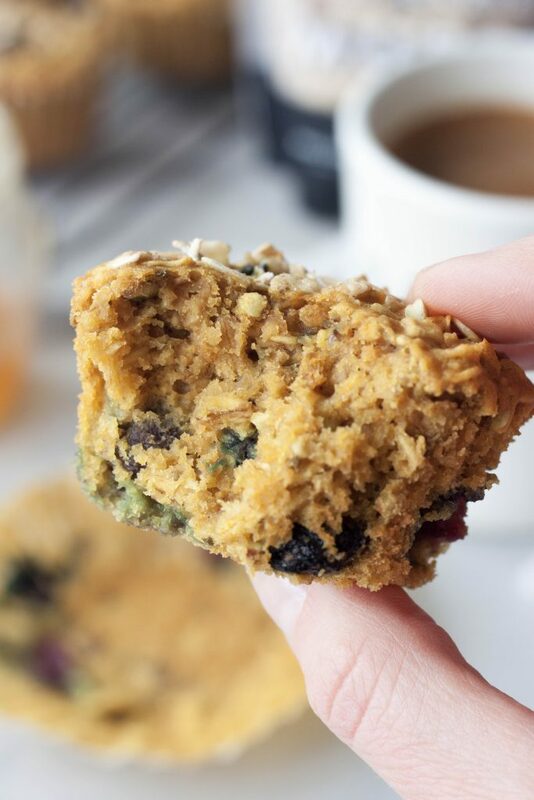 Delicious, healthy, gluten free, Lemon Blueberry Muesli Muffins (made with lemon turmeric milk, optional) are a great way to fuel your everyday adventures! I just made muesli yesterday! It would be great in a muffin! These look great! I love blueberry muffins. These sound perfect for baking on a rainy day like we’re having here! Love the lemon and blueberry flavor combo! Lemon and blueberry work so well together! 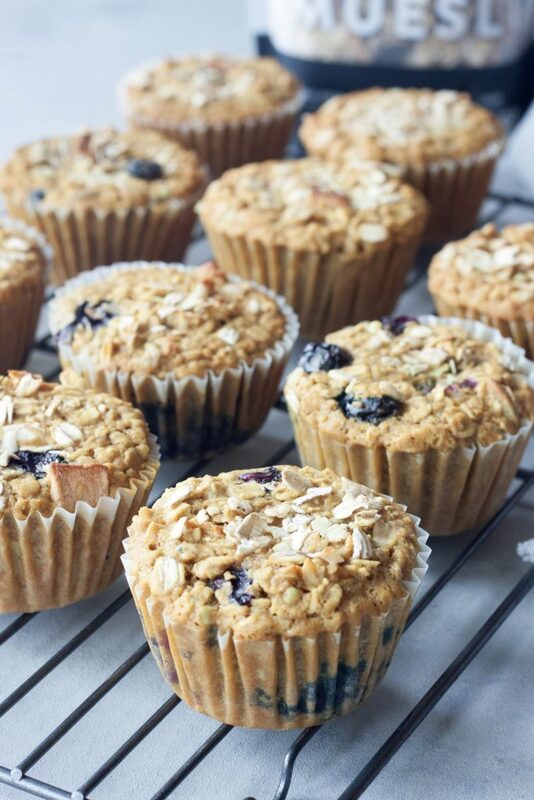 These muffins are a great way to start the day! I love muffins- these look great and I always love the lemon-blueberry combo! i love muesli too…and have made biscotti but im loving this idea with muffins!!! Muffins make a great breakfast or snack! Especially when they are as healthy and delicious as these! These look completely fantastic!! Loving your IG giveaways this week. I adore working with local companies, there are so many great one’s to highlight that don’t get the love they deserve. Looks like the perfect combo! These look delightful, so much goodness packed into one delicious muffin. Love the local honey.